There is nothing better to accompany a wedding than an organ, but it isn't always possible to get an organist. These albums contain music for the arrival of the bride, accompaniments for popular wedding hymns and worship songs, interludes and the exit of the bride and groom. 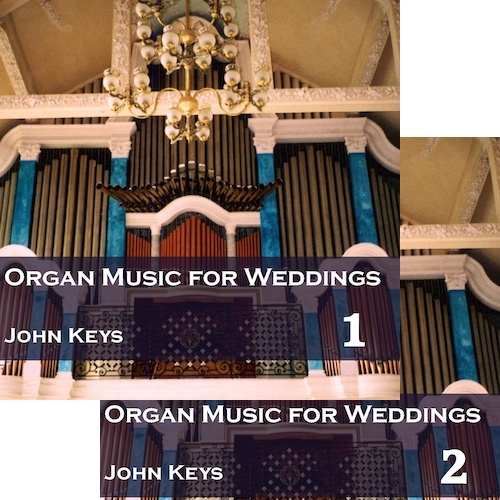 A useful accompaniment is our Organ Miscellany 1 (also available separately), featuring 22 classic pieces of organ music specially chosen for weddings or our Celebratory Organ Music album, featuring twelve longer, imposing pieces for a celebration. See below for a list of tracks. There are no voices on these recordings, just a playover and the accompaniment. Any or all of the tracks for these albums can also be download from Amazon and iTunes, or the albums together can be downloaded directly from us. To download the albums from us, use the Buy Now button here. For individual tracks or the whole album from Amazon/iTunes see the Hymns included section below. Voluntaries marked with a * are suitable for the processionals (arrival of the bride and departure of the bride and groom).